Take it From a Yoga Guru! That message is so important to your dating optimism and something I write about in Meeting Your Half-Orange: What’s important is not that you want to date, but why you want to date. And why do you? Here, I’ll help you. Why are you dating? To meet someone. And why do you want to meet someone? To be happy. Well, if your goal is to be happy, then stop making yourself miserable and nuts thinking that dating is the only way to get there! Stop forcing yourself to go on a certain number of dates per day or week or making yourself write to people online you don’t feel like meeting, and stop beating yourself up for still being single. If you’re seeking a relationship so you can be happy, well then what the heck are you waiting for? Give yourself the gift of being happy now. “Happiness not outside,” the guru also said. 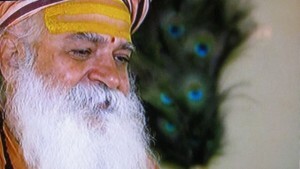 “It is within us.” The guru’s right. So find the happiness within you—which is why you’re dating in the first place—and start enjoying your life for what it is today. That is where your happiness lies and how your half-orange will come. This entry was posted on Tuesday, January 5th, 2010 at 12:08 am	and is filed under At the movies, Optimisms.